Dr. Astrid Petersen is a graduate physicist. After her studies at the Justus-Liebig University in Gießen, Germany, she earned a doctorate in experimental physics and started her professional career in 1998 with Siemens AG/Framatome ANP GmbH. Since 2002 Dr. Astrid Petersen had been responsible for fuel and waste management topics in different functions in the GNS Gesellschaft für Nuklear-Service mbH, Essen, Germany. Among other functions she was entrusted with leading the department of sales, marketing and communications, and subsequently filled the position of director and authorized representative for the KONRAD waste management and disposal project. Since April 01, 2016, she transferred as Managing Director of the nuclear business segment of TÜV NORD (Technical Support Organization) Hanover/Hamburg, Germany and is responsible for reactor quality and safety standards from construction to decommissioning and waste management. 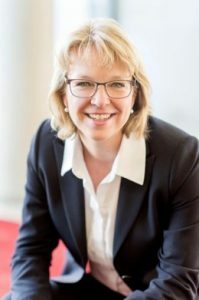 Since the 1990s Dr. Astrid Petersen has also been working on a voluntary basis in the German Nuclear Society (Kerntechnische Gesellschaft e. V., KTG) and has since 2011 been the chairperson of that organization with 2500 members from a scientific and engineering background from 2011 until 2016. Further to this Dr. Petersen is an active Board Member and Vice President of the European Nuclear Society (ENS). In her capacity as KTG chairperson she was also the head of the organizing committee of the extensive technical program of the Annual Meeting on Nuclear Technology (AMNT). She is there responsible for the recruitment of high ranking representatives of Science, Economy and Politics as speakers and participants.